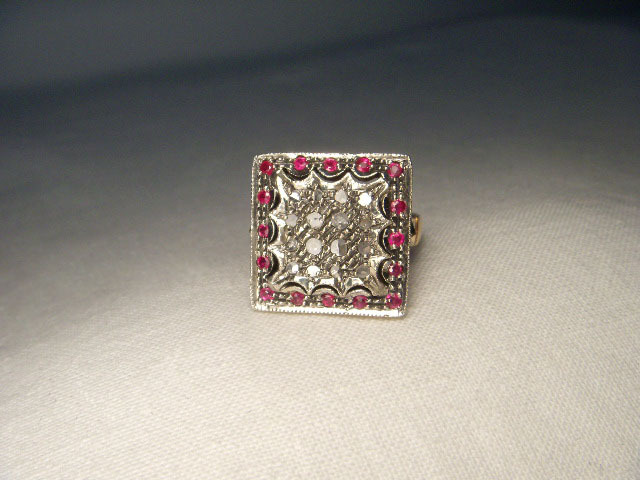 Antique 14K pink gold diamond and ruby filigree ring. This gorgeous piece features 16 rose cut diamonds measuring 2 mm each. The pendant also features 16 round natural rubies with a diameter of 1 mm each. The top of the ring measures 5/8 of an inch across. It weighs 7.8 grams. It is a size 7.5. Sizing is available.